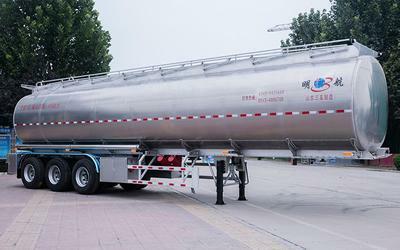 The Sanxing 30--60CBM aluminum alloy crude oil tanker trailer is primarily intended for the transportation of crude oil. Compared to ordinary crude oil tank trailers, aluminum alloy crude oil tank trailers produced by Sanxing offer the same hauling capacity with 4-6 tons of reduced weight. The tank is constructed from high quality aluminum alloy. This material prevents sparking caused by static electricity buildup, which is a highly important safety feature. Overall, the trailer is lightweight, strong, and provides significant energy savings during transportation. Sanxing has been manufacturing heavy duty vehicles and special vehicles since 1994. Besides the aluminum alloy crude oil tank trailer , we offer a wide range of fuel tank trailer, stainless steel tank trailer, flatbed trailer, cargo semi-trailer and so on. From the raw material selection to manufacturing process, we have rich experience and offer high quality aluminum alloy tank semi-trailers and other special transport vehicles with custom solutions.